Cook the barley in a medium pot of boiling salted water until tender, 20–30 minutes. Drain; spread out on a baking sheet / leave in colander and allow to cool. Make up ‘The Sauce’ ready for adding into the stir-fry. Stir-fry the finely chopped garlic and spring onion for 30 seconds. Then add the diced asparagus and soaked shiitake and stir fry for a further 30 seconds. 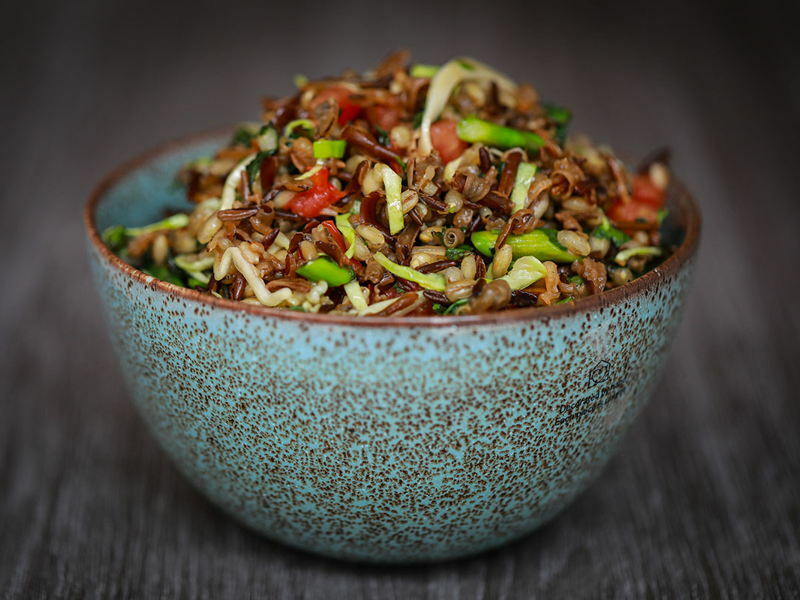 Add the cooked and cooled pearl barley and wild rice and stir-fry for a further 2 minutes. Pour the sauce into the rice and continue to stir-fry for a further 30 seconds to 1 minute. Lastly, add the diced tomatoes, finely shredded sweetheart cabbage and plenty of roughly chopped coriander. Serve.